The International Society of Hair Restoration Surgery (ISHRS) hosts the 2018 World Live Surgery Workshop for physicians at the American Academy of Cosmetic Surgery Hospital in Dubai Healthcare City, UAE from March 8-10. It is important now more than ever for both physicians and consumers to recognize the value of trained, qualified hair restoration surgeons. Education provided through the ISHRS helps to ensure these surgeons have the appropriate education to safely and effectively treat hair loss. The International Society of Hair Restoration Surgery (ISHRS), the leading authority on hair loss treatment and restoration with more than 1,100 members throughout 70 countries worldwide, will host the 2018 World Live Surgery Workshop (http://www.2018wlswdubai.org/2018WLSWDubai/) for surgeons and physicians both experienced and new to the hair restoration surgery field. 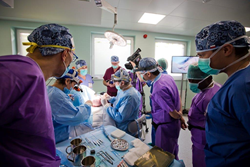 The live surgery workshop will be held at the American Academy of Cosmetic Surgery Hospital, the ISHRS’s partnering hospital, in Dubai Healthcare City, UAE, from March 8-10. The program will provide an intensive educational experience. A faculty of more than 35 leading experts will teach state of the art of hair restoration, including more than 20 international guest surgeons, who are leaders in the field, demonstrating techniques during live surgeries. There will be five simultaneous surgeries in operating theaters on each day in which attendees may freely rotate to observe. “It is important now more than ever for both physicians and consumers to recognize the value of trained, qualified hair restoration surgeons. Education provided through the ISHRS helps to ensure these surgeons have the appropriate education to safely and effectively treat hair loss,” said Switzerland-based Conradin von Albertini, MD, FISHRS, Chair, 2018 World Live Surgery Workshop. “Far too often we see patients approach our members for help, after suffering from the work of an unqualified professional. Educational programs such as the World Live Surgery Workshop improve outcomes for both physicians and patients,” he added. The ISHRS has created a consumer education site, which provides a list of questions patients should ask when seeking a physician http://www.ishrs.org/article/consumer-alert. The worldwide volume of surgical hair restoration procedures performed from 2014 to 2016 increased 60 percent, with 635,189 procedures performed in 2016, according to a 2017 International Society of Hair Restoration 2017 survey. Leading experts from around the world will demonstrate innovative techniques during the live surgery workshops including the use of various instruments used to perform FUE (Follicular Unit Excision), the strip technique, FUT (Follicular Unit Transplantation), and specialized procedures for eyebrow and beard. The use of implanters, special devices for placing the hair grafts, will also be demonstrated. The surgeries will be performed on both male and female patients and will demonstrate diverse cases. Additionally, attendees will learn from more than 40 expert faculty physicians representing 23 countries. They will conduct presentations and discussion panels on topics including donor harvesting techniques, FUE efficiency and dynamics, implantation and placing, special cases, post op care & emergencies, hair loss, surgical planning and anesthesia, non-surgical hair loss therapies. The International Society of Hair Restoration Surgery (ISHRS) is a global non-profit medical association and a leading authority on hair loss treatment and restoration with more than 1,200 members throughout 70 countries worldwide. Above all, the ISHRS is dedicated to achieving excellence in patient outcomes by promoting the highest standards of medical practice, medical ethics, and research in the medical hair restoration industry. The ISHRS also provides continuing medical education to physicians specializing in hair transplant surgery and is committed to delivering the latest information on medical and surgical treatments to consumers suffering from hair loss, and most commonly from androgenetic alopecia –male pattern baldness and female pattern hair loss. It was founded in 1993 as the first international society to promote continuing quality improvement and education for professionals in the field of hair restoration surgery. For more information and to locate a physician, visit http://www.ishrs.org. Follow ISHRS on Twitter @ISHRS. Established in 2008, the American Academy of Cosmetic Surgery Hospital (AACSH) offers a unique experience by providing optimal surgical and non-surgical care. The hospital team comprises world-renowned dermatologists, cosmetic, plastic and reconstructive specialists, head and neck, oral and maxillofacial surgeons, hair transplant surgeons, nutrition specialists and wellness therapists. In addition to providing the finest surgical and non-surgical cosmetic treatments, the facility also offers luxurious boutique accommodations, featuring elegant rooms and suites. AACSH has also designed a world-class education center style to accommodate world congress events, trainings and workshops, as well as general public education. For more information about AACSH, you can visit: http://www.aacsh.com.